the internet since 1997. We started out in 1971 designing awards part time out of the house. In 1980 we opened a retail collectibles & gift store in a small shop. In 1991 we moved into our large warehouse & office complex, At that time we changed over to a wholesale & retail mail order operation. We also expanded into selling quantity discounted products to volume buyers. 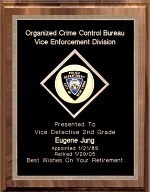 In 1996 we designed many new lines of engraved plaques and award products. We carry all types of trophies and awards for any recognition program. BestPlaques.com offers top quality products for your ceremony or special event. In 1998 we launched our 1st website. With over 20 years experience on the web and over 47 years in business, we are certain that you will always get quality products and services at BestPlaques.com. We will continue to introduce a wide variety of items to meet your awards needs. Our goal is to offer fast & friendly service , top quality products and value for your dollars.